13 Green Dragon Crescent Blade As they were thinking about what to do, someone reported, "There are two visitors coming toward the estate; there are a bunch of attendants with them, and they are leading a pack of horses." Xuande exclaimed, "The heavens have blessed us!" The three men went out of the compound to receive the visitors. As it turns out, the two visitors were big-time merchants from Zhongshan: one of them named Zhang Shiping, and one of them named Su Shuang. Each year, they traveled north to sell horses, but had to turn back this time because of the bandit rebels. Xuande invited the two of them to come in, and arranged a full banquet in their honor. He then proceeded to explain how he planned to fight the bandit rebels and pacify the citizenry. The two visitors were overjoyed, and wanted to supply fifty good horses for the cause; they also donated 500 taels of gold and silver, and 1000 catties of bintie steel, which was suitable for manufacturing weapons and other implements. Xuande bid farewell to the two visitors, and then ordered a good blacksmith to craft a pair of straight swords for each hip. Yunchang designed the Green Dragon Crescent Blade, also called Frost Blade, which weighed in at 82 catties. Zhang Fei designed a 1.8 zhang lance, the tip of which was refined steel. They were all outfitted with full-body armor. After they had gathered together more than 500 fighting men, they went to see Zou Jing. Zou Jing escorted them on a formal call to Commandery governor Liu Yan. As the three men were finishing with their formal visit, it was observed that the two of them had the same surname. When Xuande mentioned his family lineage, Liu Yan was overjoyed, and thereupon recognized Xuande as his nephew. 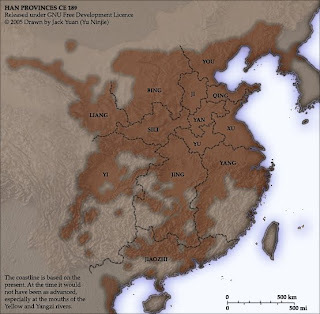 14 After not more than a few days, someone reported that the Yellow Turban bandit leader Cheng Yuanzhi was leading an army of 50,000 men, and that they were headed towards Zhuo Commandery. Liu Yan ordered Zou Jing to have Xuande and his two companions lead their force of 500 men; they were to advance on the enemy and destroy them. Xuande and his two companions cheerfully led their troops, advancing all the way to the foot of the Daxing Hills, where they met up with the bandit rebels. The bandit rebels all had disheveled hair, with yellow turbans tightly tied around their foreheads. The two armies immediately squared off. Xuande rode his horse out onto the field with Yunchang on his left, and Yide on his right. He raised his riding crop, and shouted abuses in a loud voice, "Traitorous rebels, why don't you surrender before it's too late!"